A Forward-Thinking Filter Manufacturer for the 2020s. Together, Let's Get to Work Making a More Sustainable World. Hoff Engineering makes sure our customers find high-performing, low cost options for their filter requirements. If you want superior filter performance, and the best possible effect on your bottom line, contact us. We solve filtration problems in a broad range of OEM and specialty markets. Unique construction, longer service life, and great product quality are the reasons Hoff Engineering is a good choice for filter applications. 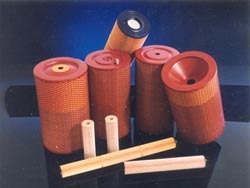 With a large selection of pleated bag filters in inventory, as well as custom designed filters, Hoff Engineering manufactures filters to suit the requirements in a wide variety of industrial sectors: automotive, wire EDM, coolant, washer and grinding fluids, wastewater, oil and gas, paints, inks and coatings, truck exhaust systems, chemical and petrochemical. Design and process engineers are constantly seeking to improve product quality while minimizing maintenance and downtime costs. Hoff Engineering has the hands-on experience and technical know-how to assist them in reducing filtration costs. Hoff Engineering has been a leader in the filtration industry for 60 years. The company earned its reputation with innovative filter concepts and products. We combine inventive thinking, broad filtration expertise, and disciplined execution to solve application-specific filtration challenges in partnership with our customers. At Hoff Engineering, ongoing investment in manufacturing process improvements and in new technologies ensure we can provide innovative, cost effective, and high quality solutions to your filtration challenges. In industrial filtration applications, a manufacturer must find cost-effective product solutions that deliver performance, quality, and value. Whether for residential air, potable water, or automotive use, filters are being asked to do more and more. Reliable, effective filtration becomes more important every decade for day-to-day living. Hoff Engineering has accepted this challenge and continues to excel customers’ expectations in a wide variety of industries including: metalworking and machine tool, oil and gas, and petrochemical.